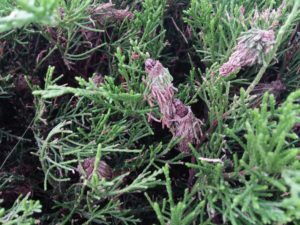 Bagworms are native to North America and can be found feeding on many landscape bushes, evergreens and trees in Kansas City, but seem most fond of arborvitaes, junipers and spruces. The visible sign that you have an infestation of this pest is the presence of light brown cocoon like bags that are covered with what seems to be juniper needles (3/4”-2” long). These cocoons dangle from the branches like an ornament on a Christmas tree would. From late May through June; the bagworms in their caterpillar stage, will poke their heads out of their bags and begin consuming their host plant. 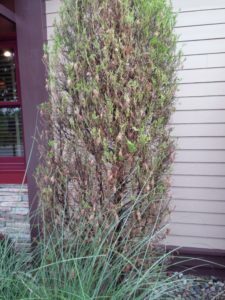 Evergreens will quickly turn brown and their foliage will disappear as the bagworm devours it. Left to themselves, if there is a large number of bagworms on a bush; they can devastate a bush within days, but they will not stop there; they will move on to another bush to do the same. The best control of this pest is to manually hand pick the bags off your bush and either crush them or place them in soapy water to drown them. On larger plants and landscapes with multiple evergreens; an application of an insecticide will be necessary. Products like Orthene, Sevin or Bioneem can be used to help control the bagworms (Read and follow the label carefully). The best offense against these destructive pests is to be proactive in your landscape in the spring and early summer, looking for their presence. 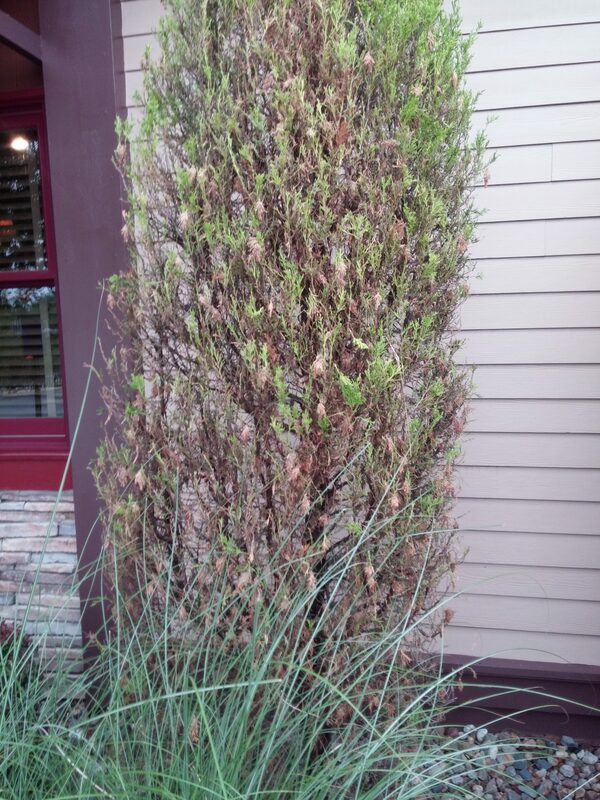 Once you see them; start manually removing them or spray as necessary so your landscape does not suffer damage.